A collection of metal trainer tags which are great to give as a gift to a runner, hiker, walker or sportsperson. They are made from metal with a brushed steel effect. 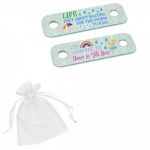 They come in a pair in a small white organza gift bag so are ready to give as a gift. Each trainer tag measures 4.5cm x 1.5cm and is professionally printed with a choice of designs. Some of the designs can be personalised to make a truly special gift. 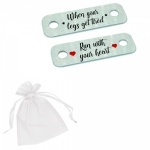 They are very popular to give as gifts with motivational and sentimental quotes/saying and wording for runners to wear in special races or marathons. 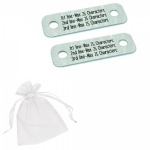 A lot of people run in honour of loved ones who have passed away and get their names printed on them so they feel them with them on their challenge. A pair of tags to fit on the laces of your trainers. They read I run because.. I like cake!.. 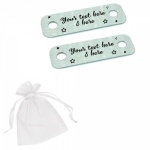 A pair of tags to fit on the laces of your trainers. 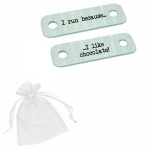 They read I run because.. I like cheese!.. 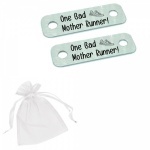 A pair of tags to fit on the laces of your trainers. They read I run because.. I like wine!..